Last evening’s East End Writers’ Group presentation on Making Your Short Stories Sparkle and Sell drew a full house of authors and readers (some are both) at the S.Walter Stewart Library Branch in Toronto, Canada. Rosemary McCracken, Madeline Harris-Callway and I got everyone involved in why and how we write and that included lots of questions from the audience. We had a real dialogue of sharing information and stories on writing fiction and getting it published. And then Rosemary reminded us all that we should each read from one of our books. I had forgotten all about reading as I was so engrossed in the conversations we were all having. Just as well Rosemary got the reading ball rolling. Because afterwards, a fellow in the audience who is also a writer came up to me and said that he likes to hear authors read. He compared it to musicians performing and said that what else can authors do to preform except read. I was surprised. Because it has been my experience that too much author reading can make the audience yawn with boredom. His words made me rethink the whole presentation situation. Perhaps we should have more reading time. Perhaps we should do more author readings. There are a lot of those in pubs, cafes, and yes library branches in Toronto. I’ve done some of those readings myself and also with other authors. I think the boredom factor might have something to do with how the author reads. If they read in a quiet inside voice, if they read with no expression, if they are not animated as they read, if they don’t have inserts about their stories and writing them between reading excerpts, maybe they lose some connection with the audience. The purpose of authors reading (besides hopefully selling some book copies) is to engage the audience, to bring the audience into their stories, to live with their characters for a time, to take the audience out of their own lives and into someone else’s, and to just listen and love the words, their flow, and the story being told. Wise words from someone in the audience. And as usual, if you click on the book cover at the top it takes you to my amazon profile and my two Beyond books. If you want to lift your short stories above the mediocre there are many things you can do. One of these is to be original in your story and in your characters. Readers like something different in their plot and eccentric characters can be a big draw whether you are writing commercial or literary fiction. Three of us commercial fiction authors – Rosemary McCracken, Madeleine Harris-Callway and Sharon A. Crawford – who write both crime novels and short stories will be discussing why and how we do it. We will cover how we get story ideas and how much is from real life and how much from imagination. A couple of us have series characters in some of our short stories and in our novels, so we will discuss how we deal with time lines. Is it difficult going back and forth from writing novels and short stories and what the heck is the difference in how you write each? Then there is marketing your short stories. Each of us has unusual ways we market our books (both the short stories and the novels). And this panel will not be just the three of us talking. We are open to lots of q and a.We want to get a real conversation going on short story writing. Here are the details about this upcoming panel being held by the East End Writers’ Group Wednesday, June 29, 2016. Do short stories come from real life, imagination, or both? How do you market short stories? For June’s East End Writers’ Group meeting join fiction authors Rosemary McCracken (shortlisted for the 2014 Derringer Award), Madeleine Harris-Callway (finalist for 2015 Arthur Ellis Award for Best First Novel), and Sharon A. Crawford (author of the “Beyond” mystery series) for a discussion on writing and marketing short stories. Copies of authors’ books available and there will be networking and food at 9 p.m. I am doing a guest blog post on Rosemary McCracken’s blog Moving Target about libraries and how they were and are important to me in my writing career, then seguing into this upcoming panel which is held at a library. There is a serendipity for me about this library branch. You’ll find this and more when my post is up on Monday, June 27 at Moving Target. Sometimes novel plots can get away from you, especially if like me, you write mysteries or thrillers. Even doing an outline before starting to write won’t stop potential confusion for several reasons. So with two nosy-parkers on the loose (often working somewhat separately) and adding in some other characters such as police Detective-Sergeant Donald Fielding and Dana’s six or seven-year old son (age depending on which book), this author is often juggling a lot of plot development. A disclaimer: I don’t do much of an outline beforehand. Sure, I have some idea of where I want the story to go, but I find if I do too much outline or summary I seem to automatically switch to write-the-novel mode and I’m off in that direction for then. So, what do I do to try to keep the plot consistent and making some sense? Make a note either in brackets in red in the paragraph or whole scene or with the Comment tool about what needs to be changed. I also keep separate files on some areas of plot development that come up and/or I want to put in. Not exactly an outline, but more of a description of what I’m trying to do…at that point. Until Dana and/or Bast step in. When all else fails I just go in there and make the changes/corrections. It gets even trickier in the current Beyond novel I’m rewriting when one of the twins suffers a concussion. But, hey I like a challenge. It is one of the things that makes writing fiction interesting. Click on the Beyond Blood book at the top to go to my amazon author profile and books. In the past few days promoting my Beyond Books and even connecting with other authors via social media has been (to put it politely) a challenge. Not all of it is my aptitude (or lack of) for maneuvering around and through computer technology. A lot of it is some of these social media sites are constantly updating how they work. You can sign in one day and all is fine and the usual. Next day – oops. So far (and I hope this is it), I’ve tried to visit an author friend’s Facebook launch. Well, I signed in on Facebook, went from my author page to her author page (I had previously “liked” her author page just after it went up). I arrived there but my photo at the top of my Facebook page, didn’t. So I had to introduce myself (that was what the author asked us all to do) by including my name with this blank box up in the left-hand corner. So, I decided instead of sticking my name in all posts and explaining the no picture problem continually I chose to just follow everyone else’s conversation at the book launch. I had congratulated the author on her new book in the first post. Later she emailed me that she did see I had attended. Weird part is when I went to her regular Facebook account page, my picture came with me. Go figure. Then, by accident while using a library branch’s computer I discovered that something was wrong with one part of connecting to my new website. If I typed in the actual URL I got there but only the page links side was “on” The content for Home had an “oops this site doesn’t seem to be here” sign. Being an avid clicker, I clicked on the links list section and voila – my Home page (and the other pages when I checked) appeared. But links to all the other social media and other Internet connections with my name in it showed up in my Google search – as did some of my photos on Google’s images. I emailed my son the computer tech. He checked and the Search Engine connection was turned off. He not only turned it on, but after I gave him a list (at his request) of all the wrong links on Google, Bing and Yahoo, he managed to delete them or whatever he had to do. Next day when I typed in my name, my new website linked appeared at the top of the Google list. There are more, but I think you get the picture. No wonder some authors complain about the time social media takes. It’s all the time wasted mucking around with the computer technology. Also I have updated my gigs in some places. In the next one Dana Bowman my main Beyond Blood character will be staying between the book covers as it is a panel of mystery fiction authors – Rosemary McCracken, Madeleine Harris-Callway and me (I’m also moderating) being held by my East End Writers’ Group June 29 at S. Walter Stewart library branch in Toronto, Canada. More details in the Gigs and blog tours page here and on my regular website here. To link to my amazon author page click on the book at the top of this post. Thank you, Sharon, for inviting me here today! I thought I’d talk about a subject that’s dear to my heart—writing from real life. All writers “borrow” from the people they know and situations they’ve been in when they create their fiction. Some to a greater extent than others. Two students in my How to Develop Your Novel course at Toronto’s George Brown College are working on novels based on their own lives. It’s not as easy a job as it might seem. Writers who turn real-life events into fiction face the same challenges that writers have with any novel. They need to create believable characters and riveting plots. But knowing the real-life counterparts and the outcome of their adventures can often curb a writer’s ability to let the characters get on with their fictional lives. They will need to expand the scope of the real-life story. In fiction, plot is the order of events in a story that gradually builds tension. The plot needs to develop with all its requisite plot points—which may take characters far afield from the people they are based on. Writers shouldn’t be afraid to impose the cause-and-effect order of plot on the story they are telling. It will build conflict and tension, and make the story more unified and enjoyable for readers. Of course, names will have to be changed to protect the privacy of people the writer knows. The writer should go a step further and change characters’ initials as well, so that Mark Manners doesn’t become Mike Madison. The character’s physical appearance, the details of his childhood and his job will also need to be altered. With my background as a newspaper journalist, I enjoy developing fiction from real-life stories that have been in the news—situations or events that happened to other people. And, yes, a story that was in the news a few summers ago is part of my new Pat Tierney mystery novel, Raven Lake. The news coverage described the plight of vacationers who had turned to rental websites to find vacation homes to rent for their holidays. They arrived at their vacation destinations in Ontario lake country only to find that they’d been duped by con artists. The cottages were actually full-time residences and not for rent at all. They lost their deposits, some lost their full payments, and they had nowhere to spend their holidays. My heart went out to these people who had driven for hours thinking that they were about to spend a relaxing week or two at a sylvan lake. I also felt sorry for the residents of the targeted homes who had would-be renters turning up on their doorsteps. Some of them were afraid that these strangers might take their frustrations out on them. A perfect crime for a mystery set in cottage country. It helped that I didn’t know any of the real people involved so I was free to create my own characters and outcomes. 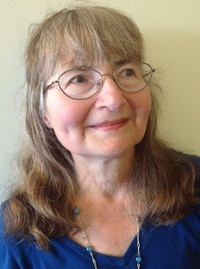 Rosemary McCracken has worked on newspapers across Canada as a reporter, arts reviewer, editorial writer and editor. She is now a Toronto-based fiction writer and freelance journalist. Her first Pat Tierney mystery, Safe Harbor, was shortlisted for Britain’s Crime Writers’ Association’s Debut Dagger in 2010 and published by Imajin Books in 2012. It was followed by Black Water in 2013. “The Sweetheart Scamster,” a Pat Tierney mystery in the anthology Thirteen, was a finalist for a Derringer Award in 2014. Rosemary’s third Pat Tierney mystery, Raven Lake, has just been released. It is available at myBook.to/RavenLakeTierney. Follow Rosemary on her blog, Moving Target at http://rosemarymccracken.wordpress.com, on Facebook at www.facebook.com/rosemarymccracken and on Twitter @RCMcCracken. Visit Rosemary’s website at http://www.rosemarymccracken.com/.